Yes, I am packing my requisites including purple boxers from Brooks Brothers (XL) for the events of next week. This brings to mind James A. Garfield, Class of 1856 and the 20th President of the United States. The number nine refers to an estimate of IQ. In 2006, University of California at Davis psychology professor Dean Simonton completed a comprehensive study examining the “intellectual brilliance” of 42 US presidents. The top 15 who appear on this list were compiled by Libb Thims — an American engineer who compiles high IQ scores as a hobby — using the results of Simonton’s study. 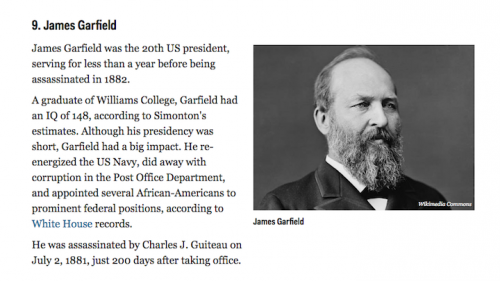 This would have been President Garfield’s 160th reunion. I will see that he is remembered.